It was a great pleasure to have the company of Alexandra and Raffi who escaped the Parisian winter for a short break with the crew of Double O. Though the visit was short, by our standards as well as theirs, we had a ball. 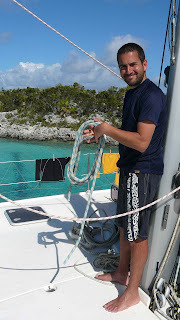 There are many highlights from this visit: Raffi swimming against the current to check the anchor, snorkelling in the Farmers Cay Cut and searching for conch salad. And now we know something about Alex that we did not: she is a serious fisherwoman. Those poor jack fish had no chance against her desire to catch them for dinner.